The Chicago Prime and Starlight Diner logo stand proudly outside a stately-looking previous shopping centre. 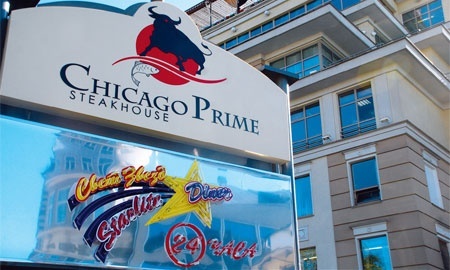 Chicago Prime opened on the 8th of August, and the fifth Starlight Diner in Moscow is to open shortly. Chicago Prime is reached by going up some escalators just by the main entrance. Escalators are a good idea if you are unable to navigate stairs for any reason. Once upstairs one is hit by a wave of warmth and friendliness rather uncommon in Moscow’s sometimes over-priced restaurants. 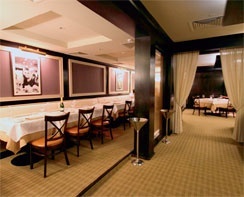 The décor is formal but subdued, with dark stained oak walls, soft lighting and sofa-type seating arranged around medium-sized and large tables, which are mostly partitioned off from each other. Mercifully, the music is not loud. On the night I visited Chicago Prime together with Ross Hunter, headmaster of the English International School, we were ushered straight to the Raw Bar to sample some of the establishment’s cocktails. The bar is suitably equipped with oysters, shrimps, lobsters, tuna and other maritime products ensconced in ice and backlit. There is a bewildering array of cocktails to choose from (twenty-four), so I went for an RG Infusion, with Rosemary-infused Hendrik’s Gin, raspberry Liqueur and Lemon Juice. This proved to be delicious, and highly addictive. Ross was served a Hang Thyme, which is consists of Absolut Citron, Simple Syrup, Fresh Thyme, and Lime Juice, which had a similar effect on the end-user, resulting in us being quite happy to stay at the bar all evening and enjoy the 120 or so other drinks on off er, from Mojitos to Grappa, to Compari and 15 year old Roge Crult. When we finally made it to the table, the next day, we discovered that the English-language menu was mercifully without spelling mistakes. 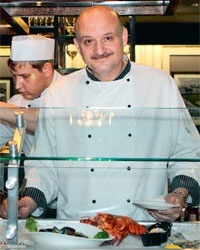 Usually menus serve as great sources of entertainment for me, a magazine editor, in Moscow’s superior eating places. The RG infusion primed me well for my Lobster and Crab Cakes with Remoulade appetiser, which disappeared too quickly for me to make any meaningful statements about the quality, except to say that they were unusual and delicious. Ross chose Grilled Quail and Baby Spinach with a Honey Whole Grain Mustard Vinaigrette salad, and was ecstatic about the effect the vinaigrette made on the spinach or lettuce. The small pieces of quail were superbly served and tasted slightly sweet and oily, as quail should. 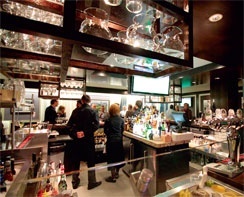 The wine list with its 12 red wines and 7 white by the glass is reminiscent of establishments such as Morton’s Steak house in the USA with private wine lockers. The task of choosing a wine to go with a steak, from the 80 or so wines in stock, has been simplified, slightly by arranged them into sections on the menu according to whether the wine concerned is light, medium or full bodied. So it is a good idea to choose your steak first and then hit the wine cellar based on the kind of steak you are ordering. With a bit of help from one of the genuinely friendly waiters, we selected Chateau Bernadotte Cru Bourgeois, Haut- Medoc form France, which was labelled a “medium to full bodied red wine.” The nose was intoxicating; the taste better. After ruminating for what seemed an interminable amount of time on which steak to choose, I ordered USA Prime Bacon Wrapped Filet Mignon with a Porcini and Rosemary Rub. There was a small problem with the defi nition of well-done, because I am from London. Well-done to a Londoner means burnt to a cinder, which of course the Chicago Prime steak was not. It was smooth, immensely eatable on a par with offerings from the best steak houses in the country. Ross ordered Double Australian lamb chops, which I understand he enjoyed apart from the garlic which he is allergic to. Food in this restaurant is served on huge plates. You think the servings aren’t that big, in fact they are massive and consequently our meal lasted a few hours. I finished off my evening with grilled cheesecakes. Ross couldn’t find room in his overworked intestines for anything else, oh journalistic work is so tiring, I decided as I ate the last cheescake. Bob Lorenz, one of the partners in the Starlight Diner company that has opened this restaurant, and one of the people behind the whole concept of opening Chicago Prime, told me that all the prime steaks are flown in, chilled, from the USA. He explained that it is not possible, yet, to source meat of the right quality here in Russia. I find this surprising, but then my knowledge of what a true American steak should taste like has only been cultivated in Moscow. plus a constant opening and closing of other businesses, means that the square is going through a bit of an identity crisis. This new eating palace is a welcome addition, and could serve as an anchor to attract other middle- to upper-band eateries to the vicinity. After all, this is Moscow’s cultural centre and the venue where the great and glamorous of the nation’s film industry, and a few from other countries, gather once a year for the Moscow International Film Festival. If the openness and communal spirit of Starlight Diners, which I felt in the Chicago Prime, is something that is going to stay, then the restaurant will draw people in from downstairs. A meal in Chicago Prime is not cheap, but it is not prohibitively expensive either. Try it out.